The Eagles wouldn't trade Carson Wentz for any other player in the NFL. Question from Brian: If you were to start a team today, who would be the top 5 quarterbacks you'd go with (in order)? That would require some thought. But in no particular order, I'd go Rodgers, Wentz, Ryan, and then I might take my chances on some immediate gratification over the next 2-3 years with Brady, and to a lesser degree Brees. Wilson, Cam and Goff would be in the neighborhood too. Carson Wentz: MVP of the league in just his second year when he tore his ACL. He has everything you could ask for in a quarterback, both physically and mentally. Aaron Rodgers: Most talented player in the NFL. He turns 35 during the season this year, but could have as many as five years left. Matt Ryan: He has come very close to a Super Bowl, but his dopey coaching staff mismanaged a 28-3 lead. Ryan just turned 33, and should still have plenty of time left in the NFL. Tom Brady: Yeah, he doesn’t help much in terms of building a long-term winner, but you’d be in a prime position to win one over at least the next two seasons. Russell Wilson: I feel like people think of Wilson as being young, but he’ll turn 30 this year. He’s very unorthodox, but effective, and just really talented. Cam Newton: I know this will draw a lot of disagreement, but Newton is criminally underrated. He’s as impressive physically as any QB in the NFL. Matthew Stafford: Again, highly underrated. Stafford has nothing to work with in Detroit. That would be a three-win team without him. Big arm, and smarter than he is given credit for. Deshaun Watson: He was awesome to watch as a rookie. Only scratching the surface. Drew Brees: Basically the same explanation as Brady above, though Brady goes out of his way to say he’s going to continue to play for a long time, while Brees does not. Marcus Mariota: I feel like a number of people have soured on Mariota, but he’s still only 24 years old, 10 months younger than Wentz, and now he’s out of Tennessee’s 1970’s offense. I’ll give him a slight edge over Jared Goff and Jimmy Garoppolo. And no, I didn’t forget about Ben Roethlisberger, who is a clear notch or two below Brady and Brees, and who has talked about retirement multiple times. Question from Norm Snead: Will Jordan Mailata be safe if he is put on the practice squad? When the Eagles snatched Nate Sudfeld away from the Redskins last year, they were able to land him for two reasons. One, Sudfeld felt that the Eagles’ quarterback-focused staff would better help develop his skills, so that he could maybe become a starter at some point somewhere in the league. Two, they paid him about the equivalent of a player on the back end of the 53-man roster, way more than the typical practice squad guy. The two above points could apply to Mailata as well, in theory. The Eagles have shown a willingness to financially reward players they value on the practice squad, and Philadelphia is a great place for Mailata to learn how to become a good NFL offensive lineman. 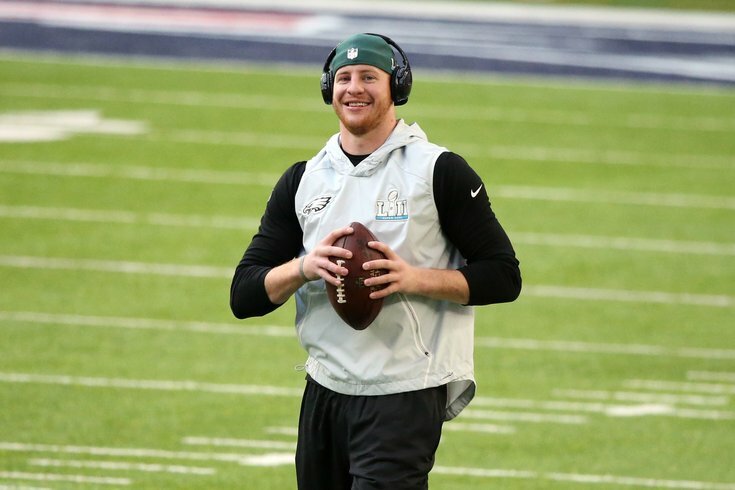 Should some crappy team try to add him to their 53 man roster, the Eagles would have to decide if one of their seven inactive spots on game day are worth using on him. Question from Euler: I know you talked about Mailata going to the practice squad, but do you think he gets the IR redshirt year because of his potential? That’s possible too, though players who get IR’d for hangnails essentially have to agree to that. The team can’t just put a guy on IR with a dubious injury against the player’s will. Question from Brian: Is it possible the Eagles still bring back Celek? After the Eagles didn’t take a running back in the draft, they quickly signed Darren Sproles to a new deal. If there were interest in Celek, I think logic would dictate that the Eagles would have signed him around the same time as Sproles, but the selection of Dallas Goedert with the team’s first pick of the draft ended that possibility. If there’s an injury at tight end and Celek is still available, only then could I see him returning.